“How to calculate the first date of the current, previous & next month” ? I have seen this question many times in different blogs and there are multiple approaches that we have been following to find it. In SQL Server 2012, we can calculate it with the help of a new built in function namely EOMONTH. In this example, I calculated the last date of the previous month and later added one more day to it to make the first day of the current month. In this example, we will create a function FOMONTH and will use it same as EOMONTH in SQL server 2012. “How to calculate the last date of the current, previous & next month” ? I have seen this question many times in different blogs and there are multiple approaches that we have been following to find it. In SQL Server 2012, the solution came as a new built in function namely EOMONTH. Lets discuss this function syntax, parameters, purpose and examples in detail. @month_to_add : A valid integer for month range from 0-9999 (Optional). By default it is zero. This function requires a valid date (Either in Datetime or varchar data type) as a parameter and returns last date of that month. There is an optional parameter called “@month_to_add”. By using this optional parameter, we can get the last date of other months also. It could be previous, next or any month. In my previous Posts, I discussed about DATETIMEFROMPARTS. Today, we will discuss one more function introduced in SQL SERVER 2012 namely “DATETIME2FROMPARTS“. This function requires year, month, day, hour, minute, seconds, fractions & precision as a parameter (All parameters are mandatory) and returns a valid datetime2 as a result. If we pass any invalid date and time parts, it will generate an error. Also if we pass NULL values to any of its parameters except Precision parameter, it returns NULL value. If we pass NULL value to Precision parameter it will generate an error. It will generate an error because only valid date and time parts are allowed as a parameter. If we pass NULL value to precision parameter of this function, it will generate an error. Scale argument is not valid. Valid expressions for data type datetime2 scale argument are integer constants and integer constant expressions. If we pass NULL and Invalid value to its parameter, it will return NULL as a result. If precision is zero , we cannot define the fraction as well. It should be zero. 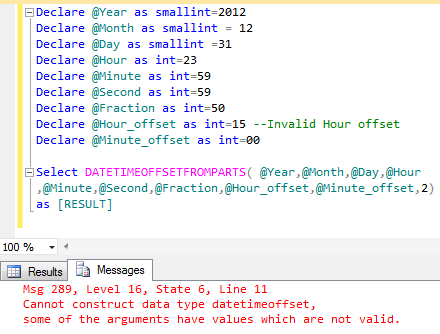 In my previous Posts, I discussed about DATETIMEFROMPARTS function in SQL SERVER 2012. 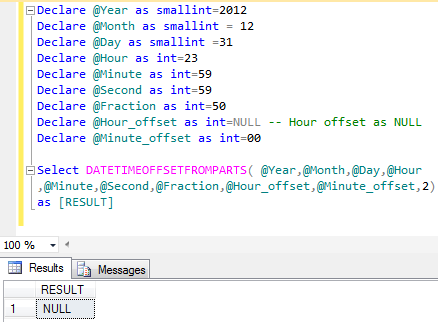 Today we will discuss one more important function introduced in SQL SERVER 2012 namely “SMALLDATETIMEFROMPARTS“. This function requires year, month, day, hour, minute as a parameter (All parameters are mandatory) and return small date & time as a result. If we pass any invalid date and time parts, it will generate an error. Also if we pass NULL date and time parts to this function it will return NULL value. Cannot construct data type smalldatetime, some of the arguments have values which are not valid. It will return NULL even if only one part is NULL. In my previous Posts, I discussed about DATEFROMPARTS and TIMEFROMPARTS function in SQL SERVER 2012. 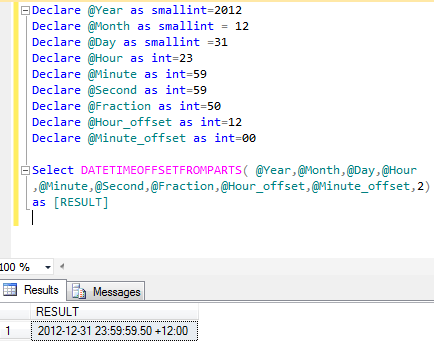 Today we will discuss one more function introduced in SQL SERVER 2012 namely “DATETIMEFROMPARTS“. @milliseconds : A valid integer for the millisecond range from 0-999. This function requires year, month, day, hour, minute, seconds & milliseconds as a parameter (All parameters are mandatory) and return date and time as a result. If we pass any invalid date and time parts, it will generate an error. Also if we pass NULL date and time parts to this function it will return NULL value. It will generate an error becuase only valid date and time parts are allowed as a parameter. Cannot construct data type datetime, some of the arguments have values which are not valid. In my previous post, I discussed about DATEFROMPARTS. Today we will discuss TIMEFROMPARTS(). In earlier version of SQL SERVER, there was no built in function to convert time parts (hours, minutes & seconds) to time. Lets have a look, how we were doing in earlier version of SQL server. But in SQL Server 2012, the solution came as a new built in function namely TIMEFROMPARTS(). Lets discuss this function syntax, parameters, purpose and examples in detail. This function requires a valid hour, minute, seconds, fractions & precision as a parameter and returns a valid time. If we pass any invalid time parts to this function it will return an error. Also if we pass NULL values to any of its parameters except Precision parameter, it returns NULL value . If we pass NULL value to Precision parameter it will generate an error. --, It means the fractions will be 2/10 of a second. --, It means the fractions will be 20/100 of a second. --, It means the fractions will be 200/1000 of a second. --, It means the fractions will be 2000/10000 of a second. --, It means the fractions will be 20000/100000 of a second. --, It means the fractions will be 200000/1000000 of a second. --, It means the fractions will be 2000000/10000000 of a second. If precision is 8 then it will generate this error. Line 33: Specified scale 8 is invalid. If we provide an invalid time part to this function, it will generate an error because only valid time parts are allowed as a parameter. Cannot construct data type time, some of the arguments have values which are not valid. If we pass NULL value to any of its parameter except Precision parameter, It will return NULL value . Scale argument is not valid. Valid expressions for data type time scale argument are integer constants and integer constant expressions. As I have mentioned above, all parameters(5) are mandatory for TIMEFROMPARTS function. Lets try to pass less than 5 parameters. The timefromparts function requires 5 argument(s).